Recently we championed the joy of older cats in Mature Moggies Week. We focused on everything from how to look after your cat as they age, to the senior kitizens currently looking for homes. As a result, many of you took to Twitter and Instagram to show off your own mature moggies as well as taking part in a special Q&A dedicated to older cats. Question: I have a cat called Eric who is 17 and a half. He seems to eat a great deal but isn’t getting fatter or thinner. He meows far more and wants to be joined to me. He wanders around to another room and then howls as if he doesn’t know where he is. Is this old age? Question: I have a 12-year-old cat and wondered if there are any natural supplements that would benefit her in old age? Are there any oils or vitamins? Answer: There are lots of really excellent complete diets on the market that are specially formulated for older cats. 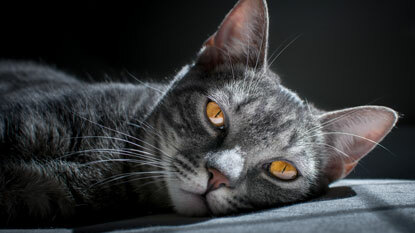 Older cats usually need fewer calories to compensate for reduced activity levels, as well as highly digestible protein. These formulated diets often have added omega 3 and essential fatty acids to help improve skin and joint health. Elderly cats are more susceptible to kidney disease, so making sure you have plenty of water available will help. Question: Is it true that some cats go off to die? My 16-year-old went missing early in the morning almost six months ago. It was totally out of character and as she was thin and scrawny, I thought she might have been ill. Despite my efforts, she seems to have just disappeared. Question: My cat is 12 and has hyperthyroidism. She is on Thyronorm and her levels have stabilised. I have her booked in for a pre-op assessment this weekend to discuss a thyroidectomy. However, she’s just had a couple of dizzy spells and she currently has a cold so isn’t interested in food. Is this normal and related to the medication? Should I see an improvement following the thyroidectomy? I believe the medication can make cats more susceptible to colds. Answer: Hyperthyroidism is one of the more common conditions we see in older cats. It speeds up the metabolism, so cats can often have trouble with digestion and tend to lose weight despite feeling hungry. 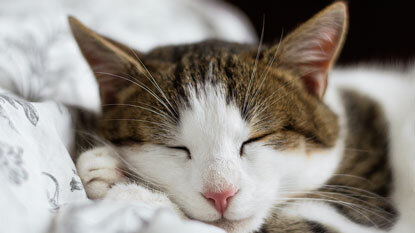 They can also have a rapid heart rate and high blood pressure and become more susceptible to opportunistic illnesses like the viruses causing cat ‘flu.’ The medication can have some side effects, but the symptoms you describe might relate more to the condition itself. I’d advise to see the vet to check that everything is on track. A thyroidectomy is a great option for treating the condition long-term, but it is a surgery, so the vet will want to make sure she is medically stable first. If you’d like to learn more about living with an older cat, head to our website.